It’s crazy what you can get up to in a church! Home » Discover Atlantic Cognac through our main themes » It’s crazy what you can get up to in a church! Would you believe that some of the churches and abbeys in the area hold heavenly surprises? Some now open their doors to the public in innovative ways, a far cry from the clichés typically seen at religious monuments. While some invite you to join them all through the night, others are experimenting with art or new technology. Come with us and discover the historic monuments of Charente and Charente–Maritime as you’ve never seen them before. What would you say to spending the night in a monk’s old cell? A jewel in the crown of Charente–Maritime’s religious heritage, the Royal Abbey of Saint-Jean d’Angély (a UNESCO World Heritage Site, no less!) now lets visitors stay in a rather unusual place. But don’t worry, there’s no need to be a pilgrim, or even religious, if you want to sleep in the church. The Royal Abbey has opened its doors to all passing travellers. To respect the spirit of the setting, the rooms made available to visitors have been stripped back to the bare essentials. But somewhere like that, is it really worth watching television or listening to music? Sleeping in the Royal Abbey is more akin to a retreat or living the life of a hermit, making it perfect for meditation and reflection. It’s certainly an experience that we recommend if you’ll be passing by Saint-Jean d’Angély, at the heart of Saintonge Dorée. Art and religion often go hand in hand. But that partnership is regaining its true meaning at one of Charente’s historic monuments. TheSaint-Amant-de-Boixe Abbey has dedicated its walls and its energy to raising artists and architects of all kinds heavenward. Festivals, exhibitions and concerts are taking place throughout the year in the nave of the church, its cellar and its gardens. One of the flagship events in Saint-Amant-de-Boixe is, without doubt, the Pays du Ruffécois Flower Show. Each year, this high-profile floral exhibition brings together around one hundred exhibitors and artists from the four corners of France. Throughout the year, life at the Saint-Amant-de-Boixe Abbey plays out to the rhythm of its many concerts and sculpture and contemporary art exhibitions. Anyone interested in arts and crafts should head to the Abbey’s cellar, where several local artists have stalls. Who says churches aren’t high-tech? The Abbaye aux Dames is one of the best places for classicalmusic in Charente–Maritime. Its music centre holds many concerts over the year, as well as the famous Saintes Festival. It also offers an immersive visit for the curious. During this voyage through sound, you’ll discover Charente’s religious heritage with the help of a headset and a digital receiver. 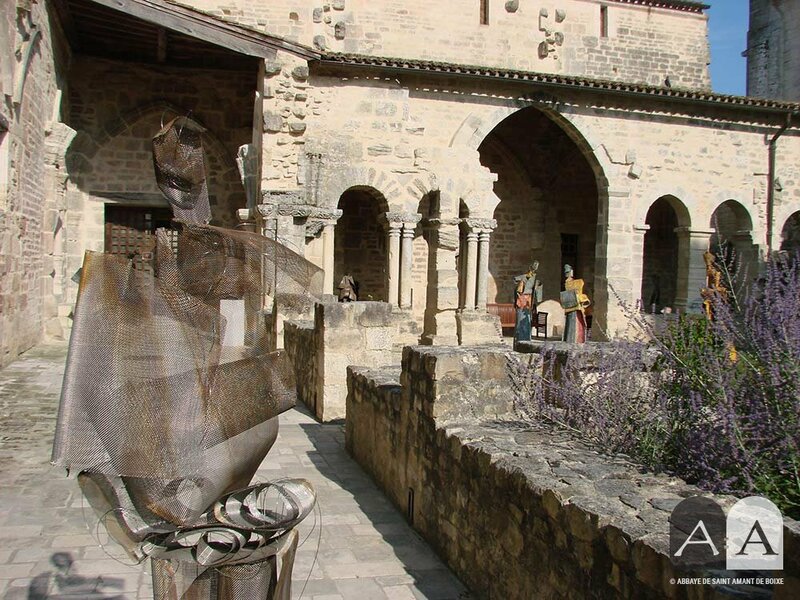 This 3D sound experience invites you to relive the biggest musical moments at theAbbaye aux Dames. After the visit, get involved in a 3D sound-spatialized concert at the heart of this Romanesque church. This special experience is a great way to explore the building’s gallery and nave. In summer, enjoy an acoustic siesta in the cloister gardens while comfortably ensconced on a sun lounger. If you’re visiting Charente as a family, take the kids to discover the Musical Carousel at the Abbaye aux Dames. This playful, interactive experience lets them experience rhythm and music. The visit is guided by Bazilik, a strange dragon with the head of a rooster and the body of a snake. Did you know that in Aubeterre-sur-Dronne there’s an underground church? When we told you that the religious monuments in Charentes would surprise you, we weren’t lying. Another unique feature of the underground church at Aubeterre-sur-Dronne is its monolithic construction – that is, it’s made from just one single block. We’re wondering what got into the 12th-century Benedictines who dug this amazing sanctuary into the cliff. Today, the Aubeterre-sur-Dronne monolithic church is one of Charente’s most popular historic monuments. But to understand why this place attracts so many people, you have to explore its nave, which is particularly remarkably sized. Imagine a ceiling 20 metres high and around 30 metres long. At the heart of this enormous cavernous world, you’ll spot the particularly impressive imposing stone reliquary. And those who dare to venture into the depths of the crypt will discover many dozens of tombs buried within this medieval necropolis. Some of the churches in the south of Charente have had an original idea. They’ve combined Romanesque art with comics to inspire young people to discover Charente’s heritage. To guide visitors, young comic book artists have created information panels in the form of comic strips. Almost forty Romanesque buildings in Charente are currently involved. If you visit the churches in the region, don’t miss the drawings created by Amandine Ciosi, Patrice Cablat and Marine Blandin.